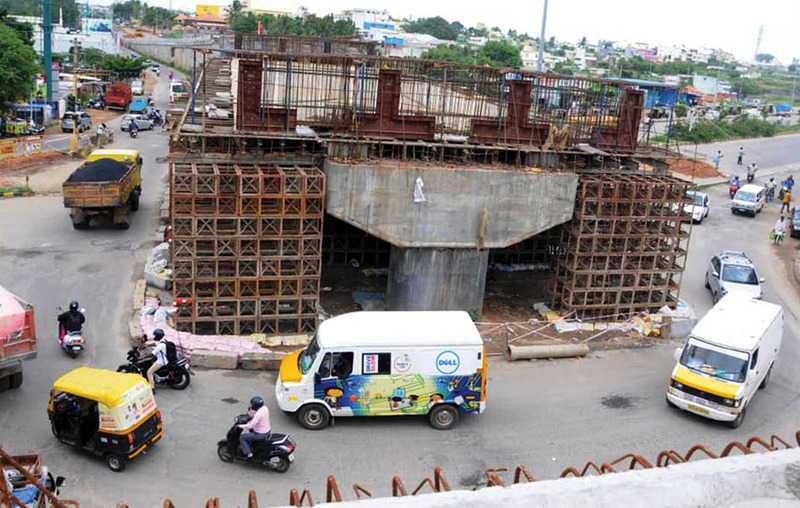 Mysuru: The much delayed work on the construction of flyover on Mysuru-Hunsur Highway near Hinkal will be completed before Dasara 2018 in October, said Mysuru-Kodagu MP Pratap Simha. The MP, along with officials of Mysuru Urban Development Authority (MUDA) and National Highway Authority of India (NHAI), inspected the ongoing works this morning. Pratap Simha said that officials have been asked to speed up the work and complete it at the earliest as it is causing a lot of traffic bottlenecks at the junction. The flyover which was also called a grade separator earlier as it was supposed to connect four roads will now be called just the flyover as there are hurdles in constructing grade separators below the flyover, he said. The cost of the project when it began was Rs. 14.81 crore. While Central Government will fund 60 percent of the costs, State Government will contribute 20 percent and MUDA will share 20 percent of the project cost. The works began on April 27, 2016 and the total length of the grade separator, including the ramp on both sides, is 510 metres. The width of the flyover is 17.20 metres. The grade separator begins from Hinkal Tent till Grand Maurya Hotel. The project came under the Jawaharlal Nehru National Urban Renewal Mission (JnNURM). However, with cost escalation and delay in construction (which was to be completed by 2017 December) the cost went up by nearly Rs. 5 crore and it is now pegged at Rs. 19.80 crore. George from Bangalore-based PJB Engineers that is implementing the project assured the MP that the work will be completed by October. Originally, a four-grade separator project at a total cost of Rs. 66.62 crore was envisaged. The grade separators were planned at Outer Ring Road (ORR) junction on Bengaluru-Mysuru Road near Columbia Asia Hospital; at Mysuru-KRS Road ORR junction near Hotel Royal Inn; at Mysuru-Hunsur Road ORR junction in Hinkal and at Mysuru-Nanjangud Road JSS College Junction near Yelethota. However, out of the four grade separators, only the Hunsur Road grade separator will be a reality now. The flyover that was proposed at KRS Road Junction faced a technical snag as the road descends too close to the Mysuru-Hassan Railway track and hence has to be realigned or dropped.